Environmentalists have slammed the latest coastal regulation zone draft which lays out a blueprint for the protection and development of India’s 7,500-km-long seaboard. The government, seeking comments and suggestions on the draft from the public, has said it is based on representations received from coastal states and union territories and other stake holders. Put together by a committee under the chairmanship of Dr Shailesh Nayak, it is, however, described by the green lobby as a capitulation to commercial interests. Environmentalist Debi Goenka, said, “The Nayak committee report is one-sided and prepared without consulting NGOs and civil society. It has endorsed every demand made by state governments to dilute the CRZ notification. 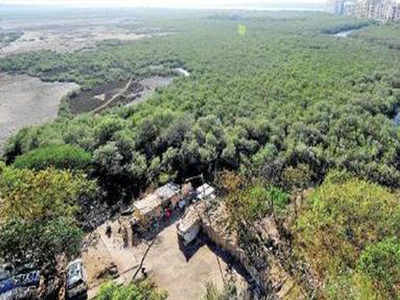 As far as Mumbai is concerned, this is a bonanza for builders, they will get much higher construction rights in CRZ areas.’’ In case of Mumbai though, the draft seeks to protect open spaces close to the shore line. While acknowledging the built-up character of the seafront in the so-called CRZ II zone, it proposes to safeguard the remaining open spaces within this belt. CRZ-II constitutes developed land areas up to or close to the shoreline in municipal limits or in other existing legally designated urban areas. 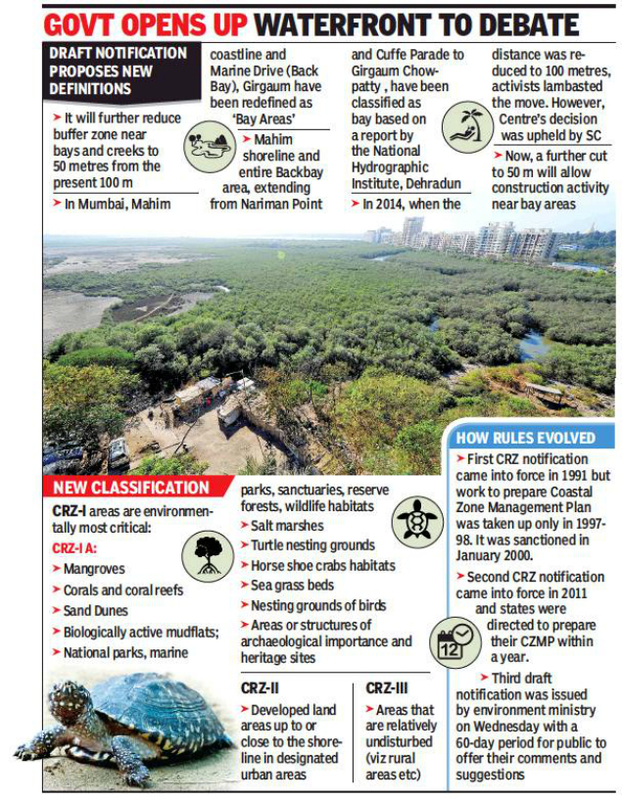 The draft says open spaces falling under CRZ II in Greater Mumbai will remain untouched. To protect and preserve the ‘green lung’ of Greater Mumbai, all open spaces, parks, gardens, playgrounds indicated in development plans within CRZ II will be categorized as “no development zone”. Limited construction activity (up to 15%) will be allowed for construction of civic amenities, stadium and gymnasium meant for recreational or sports related activities. But no residential or commercial use of such open spaces will be permissible in CRZ II areas. The draft also makes provisions for tourism activities in ecologically sensitive areas.Besides, it allows land reclamation for commercial purposes. There are certain changes in zoning as well, keeping in mind economic activities and housing of densely populated rural areas. The existing CRZIII definition of an area that is relatively undisturbed such as in a rural region will now be divided into two parts: CRZ-III A and CRZ-III B. Under the new zoning, densely populated CRZ-III A areas where population density is more than 2,161 persons/sq km as per the 2011 census will be earmarked as ‘No Development Zones’ (NDZs) from the high tide line (HTL) up to 50 metres. On the other hand, the area up to 200 metres will be earmarked as NDZ if the population density is less than 2,161 sq km and that would be categorised as CRZIII B. “The draft notification includes recommendations of the Shailesh Nayak committee which takes into account economic activities of coastal rural population and fishermen communities in all the coastal states of the country. Any activity which may damage geomorphological features in coastal areas and mangroves will not be allowed,” said a ministry official. “Stakeholders have been requested to send their comments\suggestion on the draft CRZ notification, 2018 within 60 days. The environment ministry will come out with final rules only after examining those comments,” he added.